Home > Dept. of Bio-energy > What’s PKS? Palm Kernel Shell(often known as PKS) is the residue of the palm oil refining process, the shell left over from the extraction of palm nutlet. Using PKS as the fuel of biomass energy for electricity-generating, can both reduce the emission of CO2(carbon-dioxide 2) and better off the stability of the electricity generating process. Nowadays, the “green power” ideal has drawn the most attention in the global market; many developed countries such as Denmark, Sweden, Deutschland, Italy, Japan and Korea are widely making the best use of it. PKS is a renewable fuel and a solid biomass. It does not contain even a bit of parathion, hence not a drop of acid rain will be caused. PKS does benifit both the environment and the carbon reduction. Burning PKS and coal mixed together enables reducing consumption and the emission of carbon, so it is especially suitable for industries using coal as fuel, such as cement industry and electricity generating. 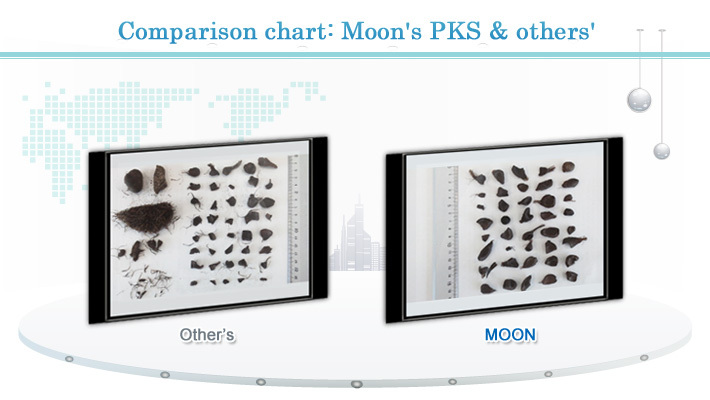 PKS' calorific value can reach 4200-4600 kcal,which is higher than the other biomasses. Its stability makes itself a better application in larger boilers. The after-burnt ash can be recycled and reused to become organic fertilizer with higher added value. We embrace Japanese spirit of management, and take "improvement" as our slogan. All the products are manufactured in self-owned plants and exported abroad. Furthurmore, we hire japanese specialists in the factory instructing the process.